Notes: In 1894 the NER began quadrupling the line between Gateshead and Pelaw, and in the process both Felling and Pelaw received new island platform stations served only by the southern (‘slow’) pair of tracks. Although the two stations were designed at the same time, their buildings were entirely different. Fawcett (2005) notes that whereas Felling was a modern-looking station with a broad, glazed platform roof. Pelaw looked like another company’s design, picked up by mistake. It consisted of a low brick building with a flat awning cantilevered out on wooden beams and finishing up with a rather ugly deep valance with shallow crenellations. At the west end the awning was supported by a lengthy screen with enormous windows, and the valance with its crenellations was continued along it. 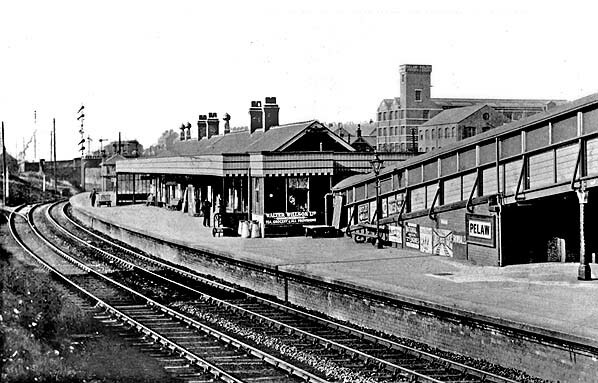 An enclosed ramp led down to the platform from the east, and it disappeared into a boxy wooden structure attached to the station building which, like the west end screen, was embellished with a continuation of the valance crenellations, and wind screens were attached. A standard stationmaster’s house was provided on the approach to the station. 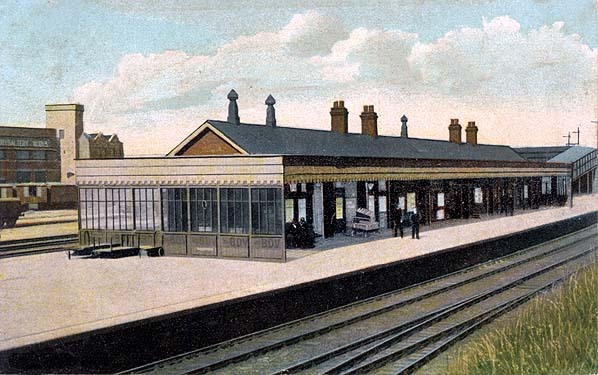 Until the end of the nineteenth century Pelaw station stood in semi-rural surroundings, with the small settlements of Wardley, Bill Quay and Heworth approximately equidistant from it. However the development of a complex of Co-operative Wholesale Society (CWS) factories close to the station provided much local employment and was a reason for the spread of residential terraces and some semidetached housing across the fields to the north of the station. 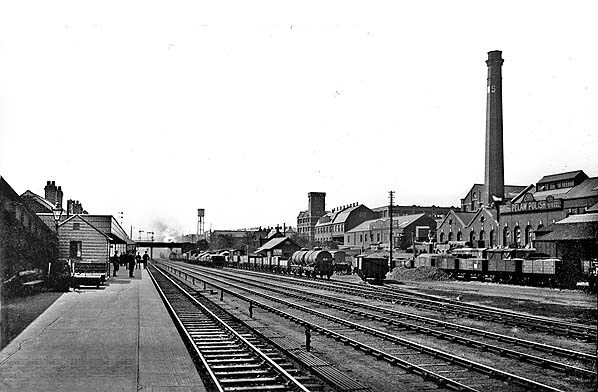 These factories were prominent local landmarks and stretched for about a mile along Shields Road, north of the station, with associated sidings. They manufactured a wide range of products including quilts, books and magazines, furniture, clothing and textiles, pharmaceuticals and household cleaning materials. The most famous product, at one time of world renown, was ‘Pelaw Polish’, for cleaning shoes. The CWS factories were closed and demolished between the mid 1970s and early 1990s as a result of overseas competition. In 1911 the NER recorded that Pelaw served a population of 25.026 and 207, 536 tickets were issued. In BR ownership in the late 1950s the station was fitted with vitreous enamel running-in boards and totem name signs with black-edged lettering. In about 1961 electric lighting replaced gas, using concrete standards with small, plain lampshades of a style frequently found at that time on streets but rarely in stations; East Boldon, Malton and Garforth were among other stations favoured with such lamps. Neighbouring Felling station retained gas lighting. In October 1960 a signal box of modern design was opened adjacent to Pelaw Junction. The Reshaping of British Railways (‘Beeching’) report of March 1963 did not recommend the Newcastle – Sunderland / South Shields local services and stations for closure, but the Washington route was earmarked. 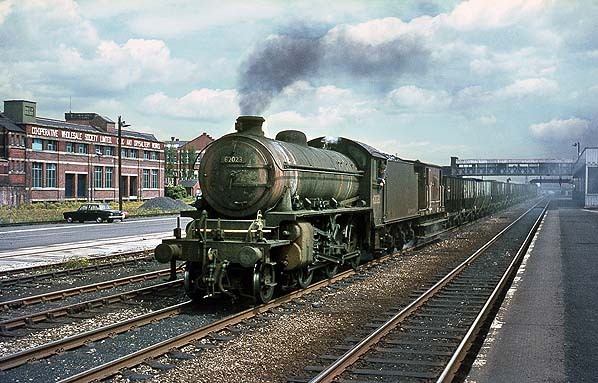 The closure to passengers of the line to Washington on 9 September 1963 entailed the withdrawal of the Newcastle to Washington train departing from Pelaw at 8.44 am and a reverse working from Washington to Newcastle which called at 5.47 pm, both operating on Monday-to-Friday only. As part of the programme of withdrawing goods services from wayside stations, Pelaw ceased to handle this traffic on 4 October 1965. On 2 January 1967 the North Eastern Region was abolished and its lines and stations were transferred to Eastern Region management. The Newcastle – Sunderland and South Shields branch local services were among those changed by the Eastern Region to ‘Paytrain’ operation in which, as an economy measure, booking offices were closed at all but the most important stations and tickets were issued instead by conductor-guards on the train. 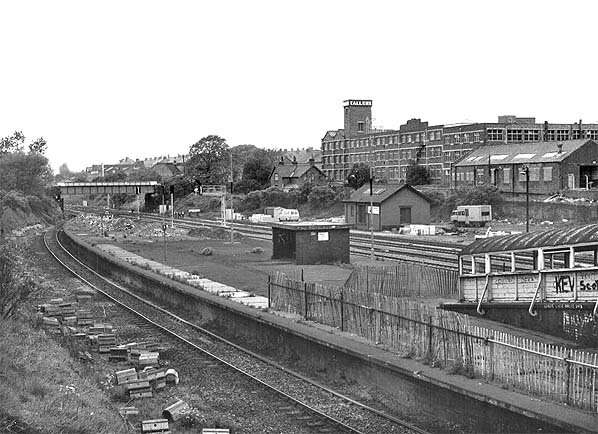 Pelaw and all of the other intermediate stations between Newcastle and Sunderland / South Shields consequently became unstaffed on 5 October 1969. Without staff in place, Pelaw station buildings were targeted by vandals. In early 1972 BR demolished all of the buildings, replacing them with a brick shelter. Electric lighting on the tall vandal-proof standards favoured by the Newcastle Division of the Eastern Region was installed. In 1974/5 Corporate Identity name signs were added. Plans were approved in 1973 for conversion of the South Shields branch to light rail operation as part of the Tyne & Wear Metro. In preparation for this Felling and Pelaw stations were to close and be replaced with a new station at Heworth approximately midway between the two to act as an interchange between Sunderland line trains (which would continue to be operated by British Rail) and the South Shields Metro services. Heworth opened and Felling and Pelaw closed on 5 November 1979. Pelaw station was demolished. 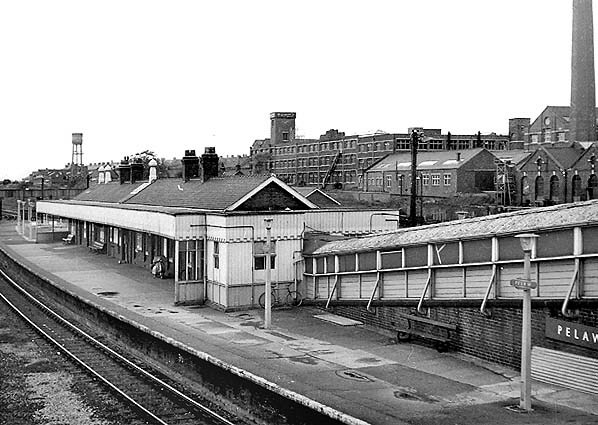 However Felling was rebuilt and reopened on 15 November 1981 to be served by the frequent South Shields Metro trains, but not the Sunderland trains. Bradshaws from Nick Catford, Route maps drawn by Alan Young. (third) station seen early in the twentieth century, looking north-west. 1897 1:2,500 OS map. Although it opened to passengers in 1896, this map of 1897 shows only the spacious island platform of the third Pelaw station towards the western edge of the map; its buildings and footbridge access were not in place at the time of the survey. The first station was located between the letters ‘FP’ and ‘FB’ immediately north-east of the third station’s platform, whilst the second station is shown further east at Pelaw Junction. A small amount of housing development can be seen to the north of the station. 1919 1:2,500 OS map. The completed third Pelaw station is shown here, with access via a footbridge from the north. In sharp contrast to the 1897 map the northern environs of the station are now occupied by the Cooperative Wholesale Society’s ‘Pelaw Works’, with its associated railway sidings, and terraced housing beyond on Shields Road. The area to the south would not be developed with housing until after World War II, thus there is no access to Pelaw station from this direction in 1919, the date of publication of this map. Looking north-east across Pelaw (third) station c1904. The somewhat austere single-storey platform building and the platform verandah and glazed end-screen can be seen clearly. In the background is part of the Co-operative Wholesale Society’s massive factory site. Looking west along the ‘up’ face of Pelaw (third) station’s platform. Although the platform buildings and access ramp can be seen to the left, the goods sidings beyond the express passenger lines are the main feature of interest here, with the fascinating variety of CWS industrial buildings beyond. ‘Pelaw Polish’, advertised on a large sign on the building, was an internationally famous product of these works. 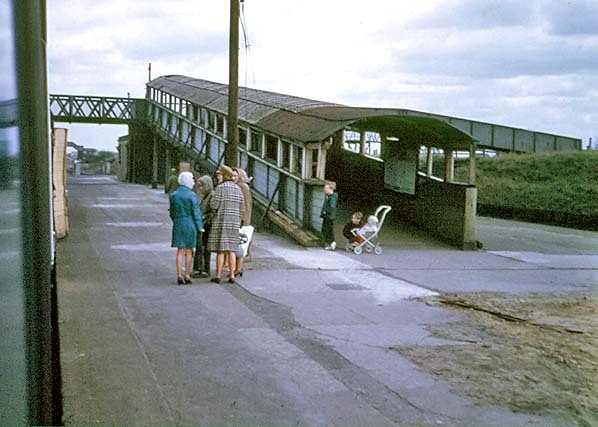 In 1966 this was the view north-west from the footbridge at Pelaw (third). 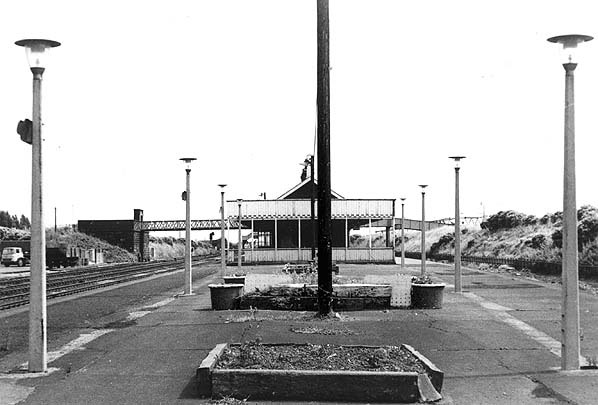 The austere platform building and the verandah are clearly shown, as are the electric lamps, installed c1961 carrying totem signs, and the BR(NE) running-in nameboard. The CWS works are seen in the background. 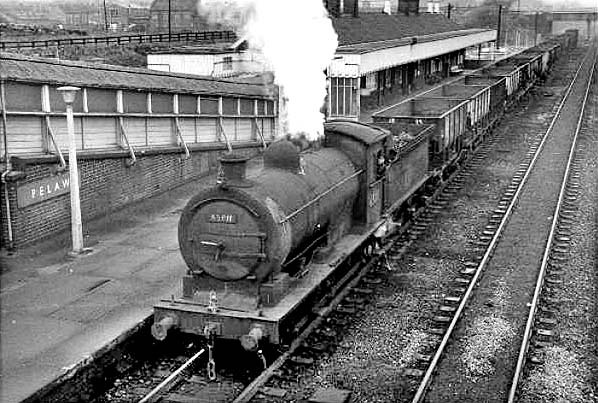 In May 1967 a coal train hauled by a Wordsall designed J27 heads east through Pelaw (third) station. 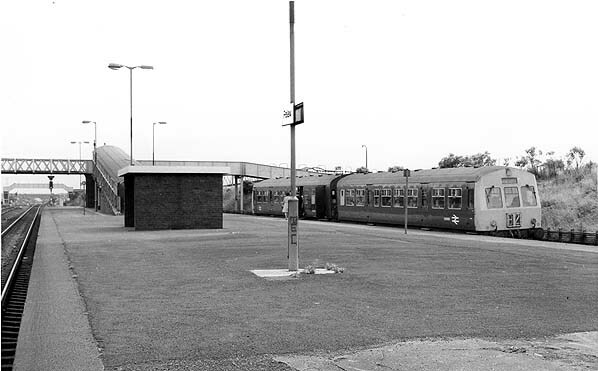 This view is from July 1969, just three months before the station ceased to be staffed. The symmetrically placed electric lamp posts (some with totems) and abandoned planters lead the eye to the building and verandahs and to the footbridges giving access to the platform. Looking east at Pelaw (third) station from a DMU on its way to South Shields on 29 March 1972. The platform buildings have recently been demolished but the footbridge and covered ramp to the platform remain as before. 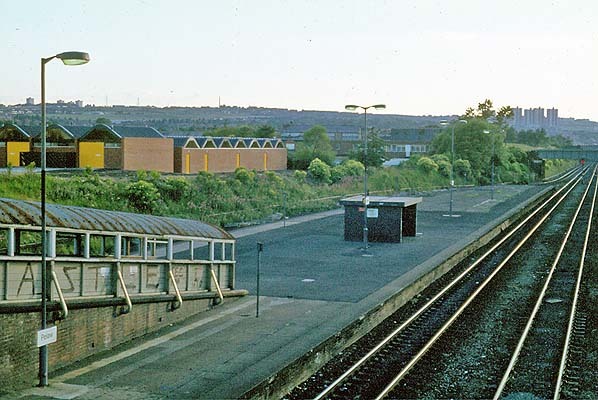 A Class 101 DMU for Newcastle calls at the ‘simplified’ Pelaw (third) station in the late 1970s.
. Pelaw (third) station looking north-west from the footbridge after closure. The lamps and signage have been removed from the standards.